Where I live, the Taurus season is the most beautiful. Life is miraculously erupting all around. The long season of winter is finally and definitively over. And what a relief that is. Beauty is nourishment. Taurus, as the fixed earth sign, knows about nourishment and what the body needs and delights in. The Earth opens up in this season to replenish our souls and bodies. If there is a perfect lunar cycle to begin a gratitude practice, it would be this one. And that is what I intend to do this Taurus lunar cycle, which begins on April 26. It is time for me to turn around my cynicism and fears. The winter was a long one, a hard one. I find myself left will little in reserve. I need this nourishment. Perhaps you do too. Uncle Bear’s enthusiasm for the benefits of a gratitude practice is infectious and enticing. Scientific research is telling us that a practice of gratitude boosts physical and emotional wellbeing. Through this practice, we are more resilient and better able to shift out of harmful states of mind and emotion. And we don’t even have to be blissfully joyous. Sometimes the thing we are grateful for is small. In fact, the research shows that the search for gratitude, even in the midst of struggle, will give us the same effects as finding something to be grateful for. Gratitude practice seems like a simple way to feel better about the world. Who wouldn’t want that? So, why is it still a struggle for me to remember? I need a push. I accept Taurus’ gift of abundant beauty as an easier way in to practice gratitude for life’s essentials. Taurus appreciates the essentials, the basic things that give pleasure, sustenance, and stability. This month, I hope to discover what is essential for good life and good relationship. An interview with Brother David Steindl-Rast (On Being ), a spiritual expert on gratitude, has recently inspired me to begin this practice. He describes the parts of a thanksgiving practice: stopping to be present, letting our senses take in the moment, and allowing enough time so the experience of joy (and it can be very small) spills over into a state of thankfulness. He uses the metaphor of a vessel overflowing. He says gratefulness needs to overflow. I am attracted to this idea—a small vessel in the heart that overfills with joy. The size is important. It must be a small vessel because the hardness of this world is big and I can’t always find expansive joy in it. Size doesn’t matter, but it must spill over. This Taurus season I invite you to find those small vessels in your heart and let them overfill with beauty and gratitude. My mantra for the practice is: Be here. Behold. Be overfilled. Be thankful. April 26—New Moon: Seeding. Can you feel the fertile Earth welcoming the seeds of intention today? Where I live, it is easy to imagine any intention I undertake right now will be well supported by the season of spring and Taurus. Not everyone lives where I do, however. So, I stretch my imagination to hold those differences, all the different experiences of Earth and season at this moment. How are these seeds settling where you live? Taurus is the sign that anchors the earth element. It brings those qualities to the wheel of life—our bodies and senses, our values and resources, the things that support and sustain us, the sacred cycles of life. Taurus is fertile potential, the most fertile of signs, and still, there is no guarantee our seeds will survive. So, we plant seeds of desire and give our dreams to mystery. Taurus is about that too. 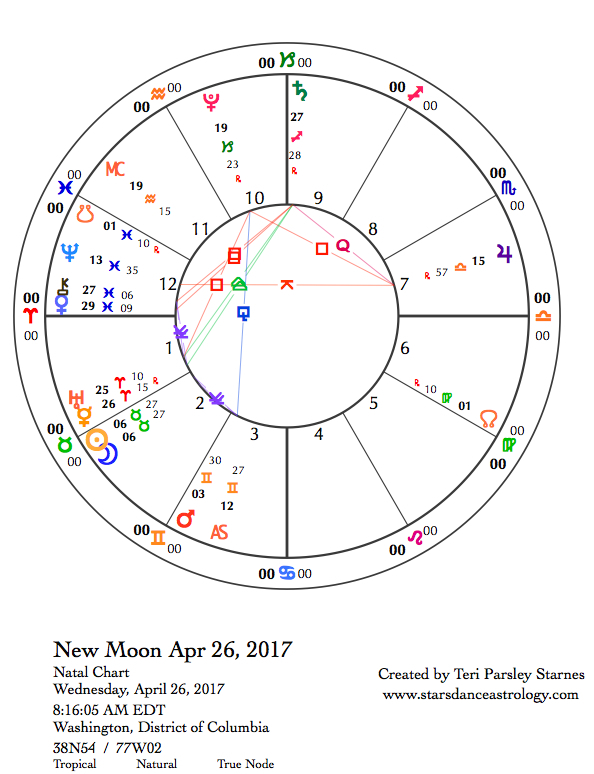 The chart for the New Moon shows retrograde Mercury conjunct Uranus in Aries. Due to retrograde motion, this is the second time Mercury has met up with the planet of change and awakenings. The first time was at the New Moon in Aries last month. Mercury is playing an interesting game. The final and last time that Mercury will conjoin Uranus is at the next Full Moon on May 10. It is almost like this trickster planet wants to make a point. We are not in control. And that doesn’t feel good under Taurus influence. Taurus wants and encourages stability. Mercury and Uranus in Aries are anything but. So, we change the metaphor. This influence is like the sudden thunderstorm that brings hail, which helps the newly sown fields to germinate. Sometimes things need to fall apart before a more resilient structure is created. We are in that process now. The longing is for stability. Saturn in Sagittarius helps by making a trine to Mercury and Uranus. Trines support. Even though things seem terribly unsettled, we aren’t giving up yet. Saturn’s influence is important. Rather than fight change, we are ready to embrace it. We have tools and are developing new ones all the time. Notice those innovations. Perhaps they are seeds of hope. At the New Moon, Venus is poised to re-enter Aries. Venus stationed retrograde in that sign on March 4 and made her way back to Pisces before turning direct on April 15. Given that Mercury and Uranus have been throwing lightening bolts our way, you may have experienced disruption in relationships (Venus’ domain), while this volatile retrograde has been going on. Now, with the Taurus lunar cycle (Venus rules Taurus), we want to get back to harmony. The task is to acknowledge that our passions sometimes make it difficult to be nice. Perhaps we can find a new way to express them. Taurus desires stability. Current Aries influence is disruptive. Chiron in Pisces just may break our hearts. In the New Moon chart, Chiron is square Saturn in Sagittarius. Chiron entered the sign of empathy and sacrifice on the day the Deepwater Horizon oil rig exploded in the Gulf of Mexico. Chiron’s journey has deepened awareness of water as sacred source of life. We see the wounds to water in the continuing pollution from this explosion in the Gulf, the continuing spread of radioactivity from Fukushima, the continuing struggle for clean water in Flint, the continuing struggle to protect water from oil pipelines crossing rivers and seeping into groundwater … this assault on water is an assault on life. The relationship between Saturn and Chiron reminds us that we have work to do. It may feel overwhelming. The seeds of prayers joined with action for the protection of water are welcomed at this fertile New Moon. Thursday, April 27. Reverberations of the New Moon continue today while the Moon is in Taurus. Uranus conjunct retrograde Mercury (exact tomorrow) is stirring things up. Perhaps it is good to notice contrasting desires—the embodied fullness of the Taurus Moon and the impatient expectation of Uranus/Mercury. We have an opportunity to practice mindful embodiment while distractions and disruptions are high. Remembering your Taurus intention, how will you honor those seeds today, which are trembling to be born? When the Moon enters Gemini tonight (CDT), energy amps up. Mercury shenanigans (unexpected retrograde events) could easily increase. The good news, we may be more adaptable to those curve balls with this Moon’s influence. Friday, April 28. Venus re-enters Aries and Mercury exactly conjoins Uranus in Aries today. Both of these events are repeats of recent transits due to retrograde journeys of both Venus and Mercury. This simultaneous retrograde period is not common and has really made an impact on the Venusian realms of relationship and diplomacy as well as mercurial things like communication and travel. Think United Airlines, and you get the picture. Perhaps today feels like an opportunity to reset the systems that have been disrupted in your life. Certainly it is a time to take another mindful breath. We are still processing. Notice the influence of the Moon in Gemini. This could be a very mentally and verbally active day. Are the words helping or are they obscuring what you need to do right now? April 29—Crescent Moon: Germinating. This Taurus lunar cycle is an opportunity to tend the seeds of embodiment. The Earth speaks to us in the language of delight (through the season of spring), sustainability (through the cycles of life, death, and rebirth), and values (through awareness of relationships and dependencies). Such strong Earth messages invite a practice of gratitude. This practice is a chance to change our relationships. What is the story of your relationship to the land? For many of us, that story relates the consequences of colonization. Due to these histories, many of us have become disassociated from responsible relationship to the land. This responsibility includes acknowledging the harms that have been done to the land and indigenous people. Perhaps gratitude is a doorway to acknowledging these consequences. If we want to grow past the harmful effects of colonization and disassociation, what actions might arise from your gratitude practice? The Crescent phase is a time to begin acting on behalf of our intentions. This is a natural time to take risks, try something new. The Gemini Moon encourages learning and connecting with people. The opposition between the Moon and Saturn in Sagittarius reminds us of our obligation to others. The movement from this social energy into Cancer encourages returning home to deepen what we are learning and desiring. As the Moon squares Venus in Aries this evening (CDT), we may notice the contrast between a need for the familiar and a curiosity about new people and relationships. Sunday, April 30. The influence of a Cancer Moon in a Taurus lunar cycle is about as homey as one can get. Are you getting homey today? Notice what home and relationship to land mean to you. Not everyone is the same, but everyone needs a sense of belonging. Saturn in Sagittarius forms a square aspect to Chiron in Pisces for the second time due to retrograde motion. The first time was in December last year and the final one will be in November of this year. This middle transit asks us to reflect on our obligations to healing relationship. This is especially true of our relationship with water. As the Moon in a water sign makes a trine aspect to Neptune in Pisces (water planet in a water sign), deepen into both gratitude and prayerful action on behalf of water. Monday, May 1. Traditional Beltane. For most of the day (CDT) the Moon is in Cancer, a complex sign that nourishes belonging and defends our sense of home. Cancer desires are strong today. That means we may feel more emotion and need more of the security and replenishment that comes from home. The Moon contacts Pluto in Capricorn and the conjunction of retrograde Mercury with Uranus in Aries today. These contacts are challenging and provoking. Our emotional reactions may be intensified by experiences of unbalanced power or stress and uncertainty. This may be a good day to anchor into a gratitude practice to ride out the waves. And because it is traditional Beltane, the cross-quarter Sabbath celebrating the season of Taurus, it is a good day to remember we belong to the Earth. How will you honor this home? How will you celebrate this beauty? May 2—First Quarter Moon: Sprouting. Has the fertile soil of this Taurus lunar cycle produced any seedlings from your lunar intention? Now is the time to notice what is growing or failing to grow. 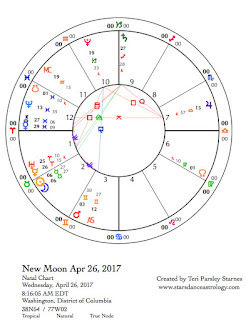 Course correction is OK. That is the challenge of the first quarter Moon: what actions and adjustments must we make to nurture our intentions? The Moon teaches us to be adaptable. Rarely does an intention manifest the way we thought it would. What new information informs your next move? My intention has been around cultivating a gratitude practice. The Moon in Leo can bestow grace and joy or it can feel like a deep questioning of our inherent value. Is this a challenge to your intention? What role does grace play in gratitude? How might gratitude restore grace that is missing? Mercury will be stationing direct in Aries tomorrow. This Mercury is still conjunct Uranus. We are pushed to go past previous awakenings. You may have a sense that life is passing you by. If that is the case, it will be even harder to resist the personal revolutions that this transit offers. With help from Moon in Leo, Venus in Aries, Mars in Gemini, and Jupiter in Libra, we are poised to say, Yes! to the next invitation. The bolder, the better. Wednesday, May 3. A grand fire trine that includes a newly-direct Mercury in Aries ignites this day. The Moon in Leo, Saturn in Sagittarius, and Mercury and Uranus in Aries are having an animated conversation. The result could be a boost in creativity. It could feel like something that has been holding you back (Mercury retrograde) is suddenly loosened. What will you do with the surge of momentum? Since Uranus is involved, we may not be entirely in control of the situation but we are darn willing to give it a go. The Sun in Taurus makes an encouraging sextile to Neptune in Pisces. Inspiration is abundant. Notice that it might be easier to find gratitude today. Thursday, May 4. The Moon in Virgo helps us check off the to do list. Today’s gratitude centers around the simple things, the kind of things that Virgo can revel in: organization, elegant solutions, pragmatic service, and people doing what they say they are going to do. Isn’t that divine? Friday, May 5. Astronomical Beltane. The midpoint of each fixed sign (Taurus, Leo, Scorpio, and Aquarius) holds special significance and energy. These fixed signs are the guardians of their elements. Taurus guards earth. For this reason, some honor this day when the Sun reaches the midpoint of Taurus as the most potent time to celebrate Beltane, one of the 8 Sabbaths celebrated by some Pagans. A grand earth trine reinforces the potency. The Moon in Virgo, the Sun in Taurus, and Pluto in Capricorn form a bond that deepens connection to the delights of earth. Beltane is a time to invoke and honor the fertility of this season. Thinking ahead, what do you hope to harvest in the fall? What magic will you create to ensure those seeds bear fruit? For me, magic requires prayer and action. Today is a good time to commit to the actions that will support your desires for the future. Revel in your senses. At the New Moon, I crafted a mantra for gratitude: Be still. Behold. Be overfilled. Be thankful. Can you feel the your vessel spilling over? May 6—Gibbous Moon: Budding. When I look at the gibbous Moon, I see a pregnant belly. That’s how this phase feels, too. We are on the verge of giving birth to the Taurus seeds planted at the New Moon. How does it feel to hold those dreams for a little while longer? The Taurus season is overfilled with beauty, making it easy to be grateful for the gifts the Earth bestows. This fixed earth sign invites us to be fully embodied. Our senses become a pathway to reclaiming our animal selves. Our animal selves know secrets that humans have forgotten. This is fertile territory. And we need this felt connection to the living world. Like that pregnant belly, getting bigger every day, take in more of Earth’s wisdom. May it sustain us through the rest of the year. The Moon in Libra encourages partnerships. Imagine partnerships with the Earth too. As Venus in Aries opposes this Moon, we also experience the desire to remain true to ourselves. The balancing point between self and other is a dance of give and take. Since Venus is back in this position after a retrograde journey, perhaps we can be wiser about doing this dance. Sunday, May 7. The Moon in Libra makes a trine to Mars in Gemini and conjoins Jupiter. We overflow with social connections. Jupiter has been at the apex of a yod aspect pattern for the last week. With the Moon as trigger, perhaps we really feel it today. This pattern involves two quincunx aspects, one between Jupiter and the Sun in Taurus and the other between Jupiter and Neptune in Pisces. This feels like idealism with an edge. It would be nice if we could forget the injustices of the world for a moment and look at everything with rose-colored glasses, but unfortunately we just can’t go back to that state of naivety after seeing what we’ve seen. A strong sense of justice motivates us to act for what is right. Monday, May 8. Things get real today. The Moon in Libra squares Pluto in Capricorn and opposes the conjunction of Mercury and Uranus in Aries. The real might even get explosive. These are transits to trigger release of energy. This release could feel liberating or disruptive. Injustices, large and small, are hard to tolerate. Tomorrow, Mercury and Uranus come together in an exact conjunction. Today, we notice the impact. Mercury and Uranus bring sudden insight, breakthroughs, and unexpected communications. Be ready to receive a jolt from the blue. Tuesday, May 9. The Full Moon occurs tomorrow, but it might feel delicious to slip into Scorpio waters today when the Moon shifts into this sign. If undercurrents weren’t addressed over the last two days of Libra Moon triggers, then the Moon in Scorpio will dig a little deeper to help us purge unnecessary tensions. Welcome the deep waters of transformation. This process is part of the Taurus season too. Mercury and Uranus continue to send jolts of electricity through the day. Release your stress before you take it out on someone else. It is OK to need time alone. Scorpio Moons bring that out in us. The trine between the Sun in Taurus and Pluto in Capricorn affirm that we need to go deep to stay solid.